Hazing is a practice that has been around for centuries, as have moves to implement hazing reform. In 1684, Harvard University student Joseph Webb was expelled for hazing that included hitting students and forcing them to perform acts of servitude. Similarly, many states have recently created bills and passed laws that toughen punishments for hazing perpetrators, several of which have been inspired by specific hazing tragedies that resulted in death. Perhaps the most publicized is the recent passing of Tim’s Law, sparked by the 2017 fraternity hazing death of pledge Timothy Piazza. 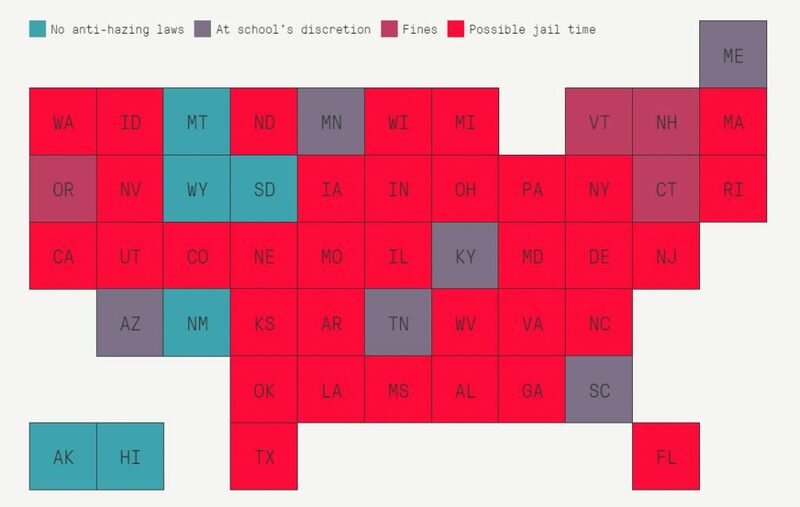 Check out the slideshow to see states that have hardened penalties for hazing. Ohio State Senator Kevin Bacon introduced a bill in Sept. 2018 that would increase the criminal penalty for hazing to a first-degree misdemeanor. It is now a fourth-degree misdemeanor under current law, according to Dayton Daily News. Two weeks after Pennsylvania Governor Tom Wolf signed Tim’s Law, New Jersey Senator Kip Bateman said he would push for his state to adopt the new law as well, reports My Central Jersey. Timothy Piazza was from New Jersey. In Sept. 2018, New Jersey Congressman Leonard Lance became the lead sponsor of the Report and Educate About Campus Hazing (REACH) Act. The bipartisan legislature will amend the Higher Education Act of 1965 and require institutions to disclose hazing incidents in their annual security report, report statistics of referrals for discipline and arrests specific to hazing, and implement a hazing education program for students. Want to know what the hazing laws are in your state? Check out the graphic below from stophazing.org or check out this list on their website for more detailed laws by state. The post 6 Tragedies That Spurred Harsher Anti-Hazing Laws appeared first on Campus Safety Magazine.